Home / ZeroHourXD Blog / ZEROHOUR HAS ARRIVED! The words you’ve been waiting for… ZEROHOUR HAS ARRIVED!!! We are now shipping from our warehouse. We were able to send over 100 units tonight, and we will be shipping continuously until we are done. You can begin tracking your shipment over the next few days, and we expect packages to arrive beginning Friday and through all of next week. All U.S. 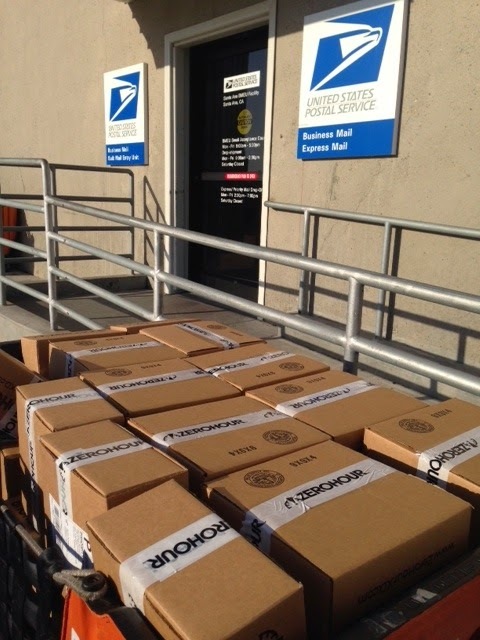 Domestic packages will be sent by USPS Priority Mail 2-Day. International shipping labels have not been printed, so hang tight, global backers! We expect e-mails with tracking numbers to begin going out in the next couple days. International packages will be sent via DHL Express, 3-5 day ship time. In our excitement to get ZeroHour to you, you’ve seen that we have had to revise dates as we've projected our path and, naturally, there were unexpected delays that we should have built in. This is the first product from ZeroHour, so we appreciate you bearing with us through our learning and we will better incorporate these factors into future timing. ZeroHour's original design was refined, upgraded, and programmed for tooling, and the part and packaging molds were created. This accounts for the bulk of the first run production timing (the actual manufacturing and packaging doesn't take very long), so we will now have everything ready to mass produce ZeroHour for the future. You’ve been very patient for us through all of this, and we really want to do everything we can to keep you happy, which we know you'll be once you have your product! Now it’s your turn to show us what ZeroHour can do. We want to see you in action! Share with us on Facebook, Twitter, and Instagram, and tag your photos #ZEROHOURXD. We’ve taken photos of our prototype everywhere, but we're really looking forward to seeing ZeroHour in your hands.